Big news in the TV industry today. From Apple's big announcement to a highly anticipated premiere date at Netflix to a surprising first look at The 100 Season 6, we've rounded up some of the day's biggest stories for you below. Apple (finally!) unveiled its streaming service. Apple TV+ is the name for the new service which has been in the works for quite some time now. It is slated to launch to the public in Fall 2019, according to video programming heads Zack Van Amburg and Jamie Erlicht who opened up about the platform during a company event in Cupertino, California. Pricing has yet to be confirmed, but we do know the service will be ad-free. The prices will likely follow in the coming months. Given that Apple has been aggressively commissioning TV shows for the service for quite some time now, and the roster of A-list talent, it's hard to imagine it being lower than the ad-free version of Hulu or Netflix. Jennifer Aniston, Reese Witherspoon, Steve Carell, Kumail Nanjiani, Steven Spielberg appeared during the big reveal. The good news is that subscribers will be able to download content, and if you're across the pond and worried about what the new service means for you, then we have good news. It will be launching in over 100 countries! There's a sizzle reel for some of the shows coming to the new service at the bottom of this post, so watch away! 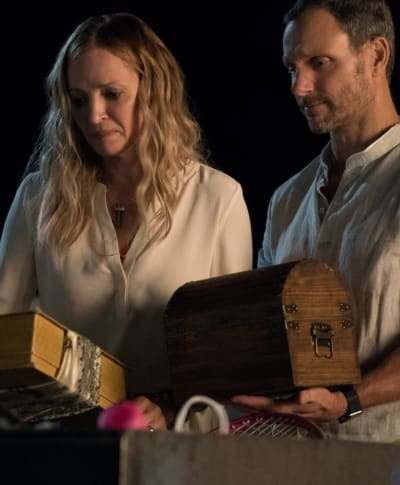 Meanwhile, Netflix has unveiled a premiere date for Chambers, a spine-tingling supernatural drama that boasts a cast that includes Uma Thurman (Kill Bill) and Tony Goldwyn (Scandal). "A young heart attack survivor becomes consumed by the mystery surrounding the heart that saved her life," reads the official logline. "However, the closer she gets to uncovering the truth about her donor's sudden death, the more she starts taking on the characteristics of the deceased -- some of which are troublingly sinister." Netflix has confirmed that the entire first season will debut Friday, April 26. Elsewhere, there's some good news for The 100 Fanatics! We have your first look at the upcoming sixth season of The CW's hit sci-fi drama. Showrunner, Jason Rothenberg took to Twitter on Monday to unveil the first look photo. "A few of you have been asking about the TRAILER. I can’t share that today, but here’s the 1st-ever image from it," he shared. "Thanks for your patience. 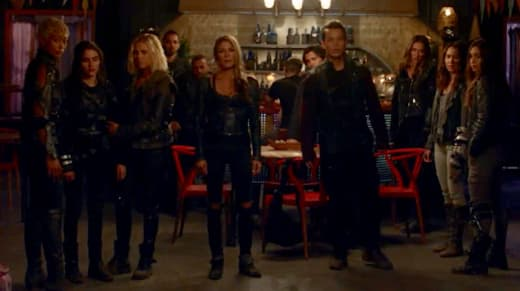 #The100 #The100Season6"
The photo does give us our first look at some of the key players, so it's a good thing to get just before the trailer.